Sprite Blue Revo Optical. 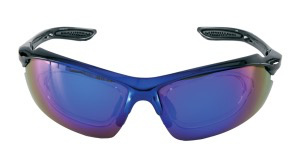 This style comes with an optical insert that sits snugly behind the main lens. An optician can fit your prescription lens in this insert so that you can enjoy the look and the protection that this eyewear gives. 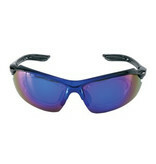 Fantastic quality, superbly styled sports eyewear for the true enthusiast. Great Cricket style. TR90 high grade graduated frame in classic black/royal high lustre finish, PC blue Revo lenses, extra orange light enhancing lenses, quality zip case and combined cleaning cloth/pouch included. This style is suitable for all sports including cricket, golf, tennis, running, cycling, motorcyclying, snowboarding, horseriding, hiking and skiing.